Revelation just before I left for vacation...my life is going to change in July. In July, my close friend C-Dazzle and her partner are leaving for a round-the-world adventure. I have known this for some time (since February), and as the magic date quickly approaches, and they complete more necessary steps to leave...I have realized what it means to me. Jason and I have joked that we need to audition couples for the position of our NEW BFF's. There are big shoes to fill! There are the obvious losses that I will have to adjust to: who am I going to have girl talk with? who will I go for pedicures with? with whom will I eat french fries for dinner? who will I spend a lazy day with? Jason is great...but after the exfoliation and moisturization scandal of 2003, he isnt' that great. Without C-Dazzle around...Who will come to visit me and not want to DO something? Who will know my story and care about me anyway? Who will drive to me, and never expect me to drive to them? Who will stand in line and get me lunch when I'm wobbly? Who will see me in all my situations, and not get scared away? My relationship (and I should also say OUR relationship with C-Dazzle and Jay) has developed the most since I "went berry picking" (or got sick). One of the highlights of the past three years has been my relationship with C-Dazzle. I haven't been able to lead a conventional life for three years - and C-Dazzle has been generous and un-conventional. So without her, I have to ask myself...Will I be able to put myself out there for new friendships? Will I be myself? Will I muster the courage to leave my side of town, and not fear the wobbles or fatigue finding me while I am out? 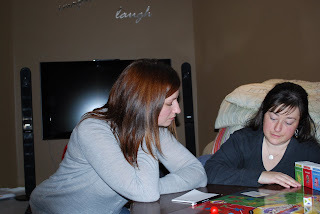 Will someone else understand what it means to have a friend who has MS? Maybe I should have C-Dazzle write a letter of recommendation for me. My first ever ride on a horse! You will notice that my dad and I are sporting our "Em's Slackers...Believe in a Cure for MS" t-shirts! I am so happy to have been in a "really good place" for a few days now. On this particular day, I had energy like I haven't had in months...and we all ran (or rode!) with it! It's that time of year, when I take begin to take stock of what has happened to me in the past three years. I count my chickens and my gray hairs. how many relapses have I had? My relapses have been defined by severe "subjective vertigo" and one wicked "pain in my head" (I stress that it was a pain in my forehead, as opposed to a "headache"). I don't have any NEW numbness or tingly feelings. The original numb spots are still present, and at times I get a numb feeling where I haven't had a numb feeling for two years! Like today, my chin/throat area feels numb, but I had this in same feeling in August 2006, and it is likely caused by a lesion in my thoracic spine. And...let me do the math...I have gone over fifteen months without a relapse! While I still seem to struggle with the notion of a routine - to have or not have - I realized that one "routine" has been broken. For some time now, I don't feel as if I have to accomplish something (or not do something) within a specific amount of time "because I have to go to work tomorrow". That's right - I have broken free of the haunting, "I'm going to work on Monday" feeling. This isn't to be confused with wondering if I CAN work, or feelings of meeting self-imposed responsibilities...it is just the feeling of getting out of bed, and spending 8-10 hours at paid employment. It was like a habit...predictable...it became a part of who I was. And now it isn't. I still haven't managed to comfortably answer the question, "do you have a job that you go to? ", or "so what do you do? ", or the simple, "where do you work?" I met someone new a couple of weeks ago, and sure-shootin', she asked me, "So do you a job that you do on top of making jewelry?" My answer..."No. I have MS". I was mortified at myself! What a way to answer that question! Why couldn't I have said, "No, not right now"? Heck, even, "Nope" would have been better than what I did say. What a way to make someone uncomfortable...including myself. So I am finally comfortable with the fact that I'm not going to work tomorrow, so hopefully next, I can find a way to be comfortable in telling people that. I can't remember if I posted the results of our Em's Slackers MS Walk team fundraiser. If I did, I'm sorry for the repeat, if I didn't I'm sorry that it took so long. As you may remember, we sold lotions, lip balms, soaps, and wax melt fragrances. In my opinion, for a first try, and a quick time frame, we were very successful. After covering all costs, we donated an additional $280 on top of the direct donations that we collected. The packages have been assembled, and will go out to the buyers this week. I would like to thank Bovine Bubbles and Hogwash for not only creating a wonderful product for us to sell, but for her speed, patience, and kind heart. 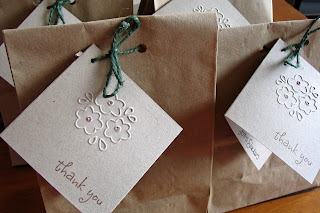 I would also like to thank Harvest Moon Paper for the adorable thank-you cards that we have attached to each package. Both of the women behind these businesses are wonderful talents, and generous individuals. Please check out their Etsy shops, and be sure to bookmark them for when you need a new bar of a soap, or a sweet card for a special occasion! If you weren't able to make a purchase this time around, don't fret! We hope to be back with a line of products in the fall, just in time for Christmas! I expanded my personal travel zone for this week. I ventured out to the downtown doctor by myself, as well as to a mall. As I have mentioned before, I have a parking permit for disabled parking spaces. On days when I am by myself, it would make sense for me to use it, but on these two occasions, I didn't. I have the pass to help me for days when I am tired, or wobbly. The thing is, if I feel that way before I go out, I simply don't go out, especially by myself. The idea behind the permit is that while I am going about my business (ie. a doctor's appointment), that nasty fatigue or weird wobbles could sneak up on me, and it would be helpful to have the car nearby. But since I pull up to the location in a good physical state, I feel guilty for using it. At the mall, it would have been easy to find a designated parking space, but at the hospital, it would have been next to impossible. Parking lot signs were flashing "FULL", side streets surrounding the hospital were full...after driving around the block, I got in to a parking garage, taking a ticket upon entering. I ended up parking at one end of the lot, and walking down the street to enter the hospital. After my appointment, I had to pay my $6 (for 70 minutes!) at the ONE pay station for the entire lot...nowhere near my car. Luckily, the lot was located at the end of the hospital closest to the doctors office. Would it be a silly idea to have a form of valet parking available for disability parking permit holders, especially at hospitals?